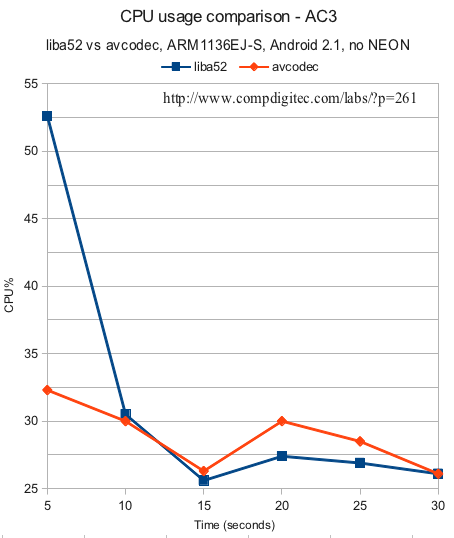 VLC for Android pre-alpha benchmarks (Feb 1, 2012) for various audio codecs. adb shell "/system/xbin/busybox ps aux | grep vlc"
adb shell "/system/xbin/busybox top -b | grep <pid of VLC as above>"
Comparing three popular codecs for decoding OGG vorbis files, libavcodec from libav, vorbis and tremor. 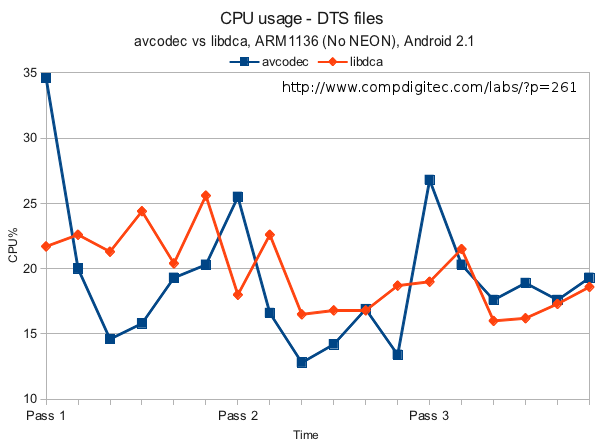 So, it seems avcodec is the clear winner, followed by tremor and lagging in last place libvorbis. D/vlc     ( 6768): using decoder module "a52"
D/vlc     ( 6829): using decoder module "avcodec"
D/vlc     ( 2461): using decoder module "dts"
D/vlc     ( 2510): using decoder module "dts"
D/vlc     ( 2536): using decoder module "dts"
D/vlc     ( 2583): using decoder module "avcodec"
D/vlc     ( 2607): using decoder module "avcodec"
D/vlc     ( 2633): using decoder module "avcodec"